Learning to swim is a critical skill for our children. Group lessons are typically a great start. Our group lessons are for ages 2 and up. We group the kids according to age and skill level and have an instructor to student ratio of 2:1 or 3:1. We know how to teach while having fun! Stay tuned for the 2019 Swim Lesson Schedule. Individual lessons can be scheduled directly with one of our instructors. Cost is typically $15/hr for members; $20/hr for non-members. Sign up: Sign up by emailing us at gpbluesharks@gmail.com or by stopping by the pool for the “sign up binder.” Include your child’s name and age, and your email and phone number. We will call you the week prior to confirm your attendance. Pay: You can pay at the first lesson with check, cash, or card. Please come a little early or stay a little late to take care of this. We will provide kickboards that are used in lessons. We don’t use “swimmies” or other such wearable floatation aids in swim lessons. It’s often best to not even bring them along to the lesson. If your child is “addicted” to swimmies, bring them but be sure to explain that swimmies help you float but kickboards help you swim FAST, so we use kickboards! Also you can let your child pick out a small toy to bring to the lessons to show their swim teacher. We’ve got a little time built into each lesson for this chance to bond. Let’s face it, sometimes kids cry. It’s important to stay calm and stick with it. Don’t stop swim lessons if your child cries. Remember that swim lessons are a life-saving skill and just as important as wearing a seatbelt. If you feel uneasy or anxious watching your little one cry, then your swimmer may pick up on that. Try to remain calm. Sit in a lounge chair and read a book or magazine, look up and smile from the sidelines to your little swimmer. If your child constantly looks at you instead of their teacher, consider moving under the pavilion or to the far side of the pool, so that your swimmer can focus on the lesson. Remind yourself that soon they will be more comfortable with their instructor and in the water and won’t have those tears. 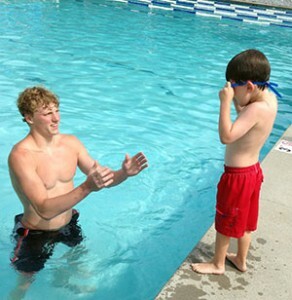 And then, your child will begin to enjoy swim lessons and gain confidence in the water. After all, that’s why you’re here! We also offer private lessons for members and nonmembers. The cost varies by instructor but is typically $15-20/hr.